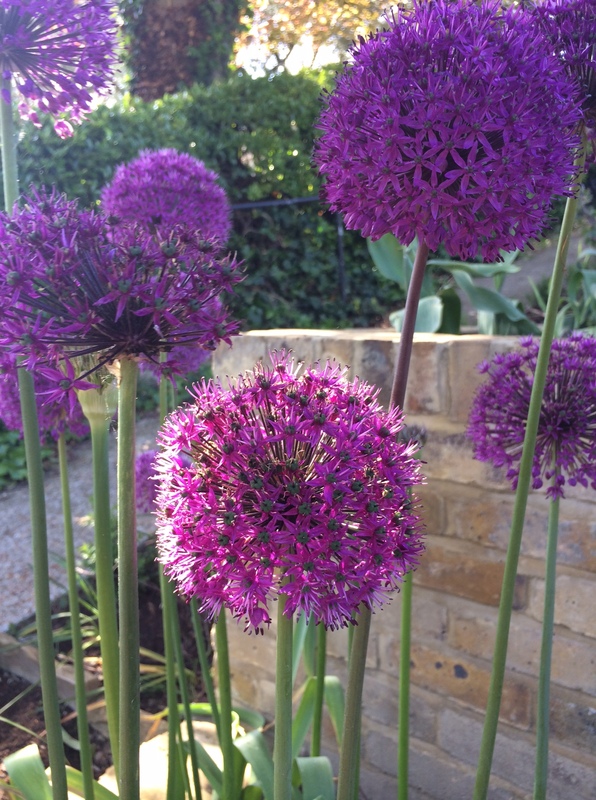 The alliums are now fully out and looking so spectacular that I had to show you them again! I adore these balls of beauty. 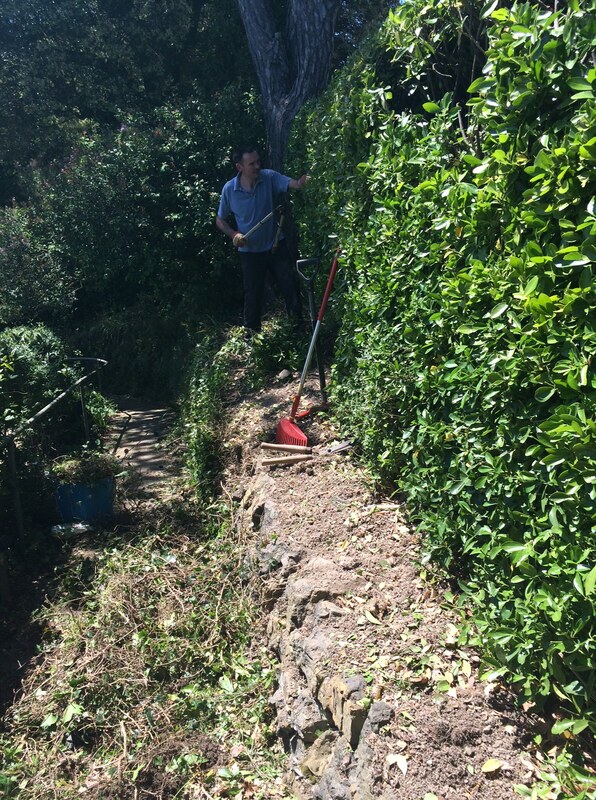 I should have taken a ‘before’ shot, ie, before David cut the hedge and the edge was cleared, but you can get an idea of what it looked like from the mess on the path. 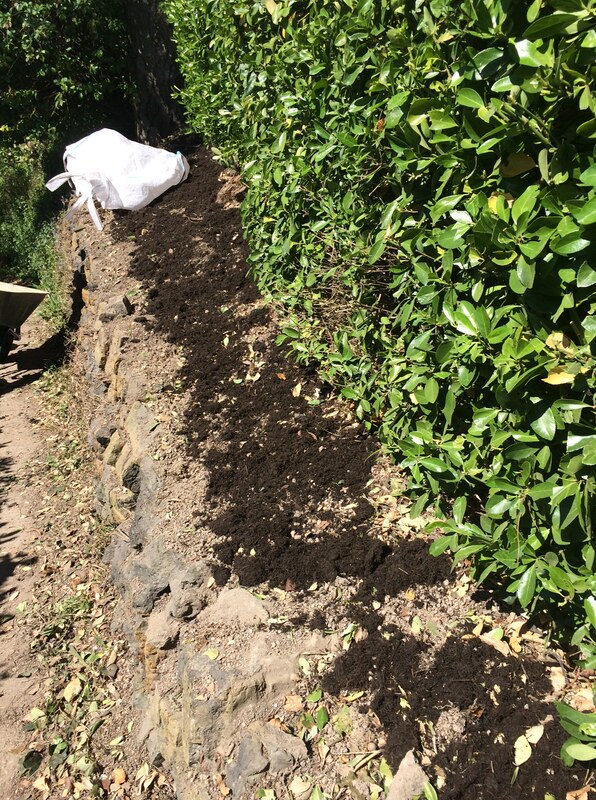 We planted grasses, geraniums, bergenia, achillea, osteospermum and erigeron – all plants that don’t mind it dry and cope with baking sun and a bit of shade (fingers crossed). These were mostly plants that we propagated from others in the garden or grew from seed. 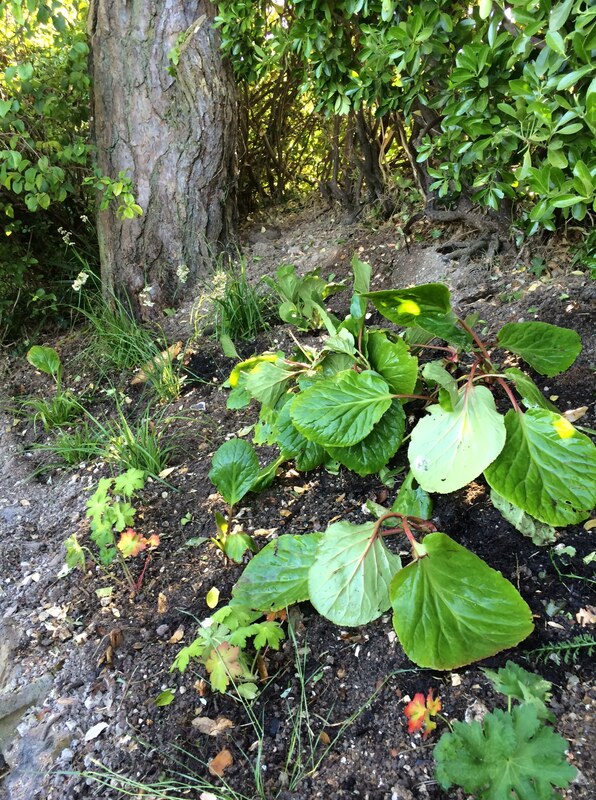 A big clump of bergenia that we transplanted from behind the shed with luzula in the background and geraniums in the foreground. The tree is a large maritime pine. 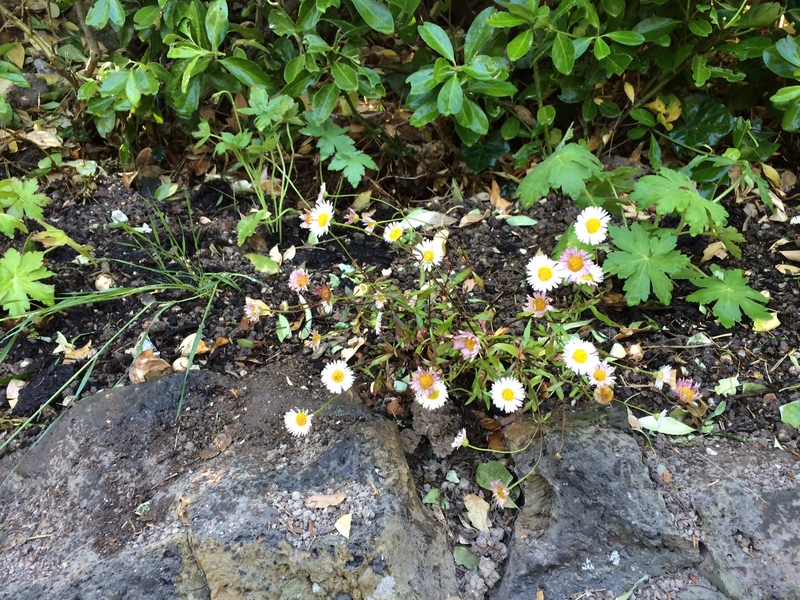 I hope the erigeron will take here as well as it has done on the front steps. This is what the heaps look like at the moment: A Mess. There are two collapsing bays, completely overloaded and with potatoes growing out of them(! ), and two plastic bins that we don’t use. 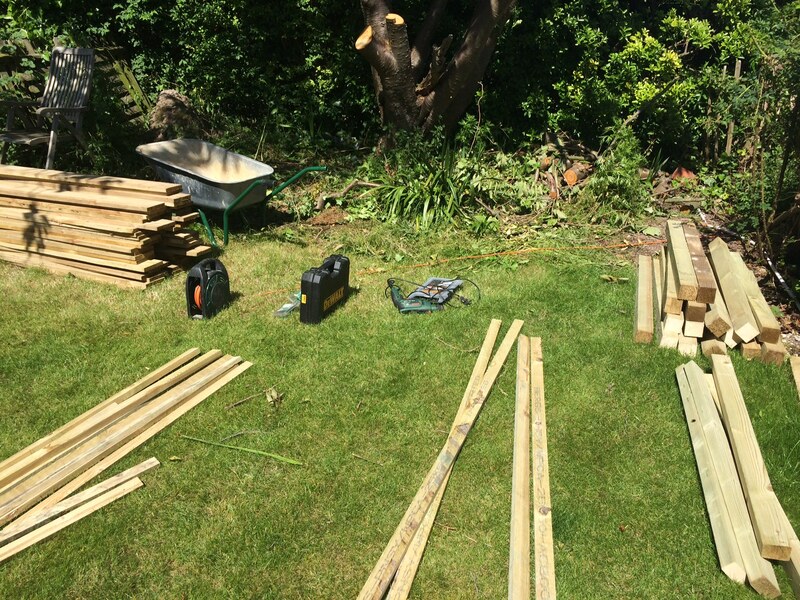 Wood and tools ready to go. In typical ‘taking on too much in one day’ fashion, we only got as far as making the two end panels. The plan is to have three compost bays, each roughly 1.2m square, so we can use one to turn each heap to aerate it. I’ve read about all kinds of interesting ingredients and that it’s important not to have too much nitrogen-rich material. 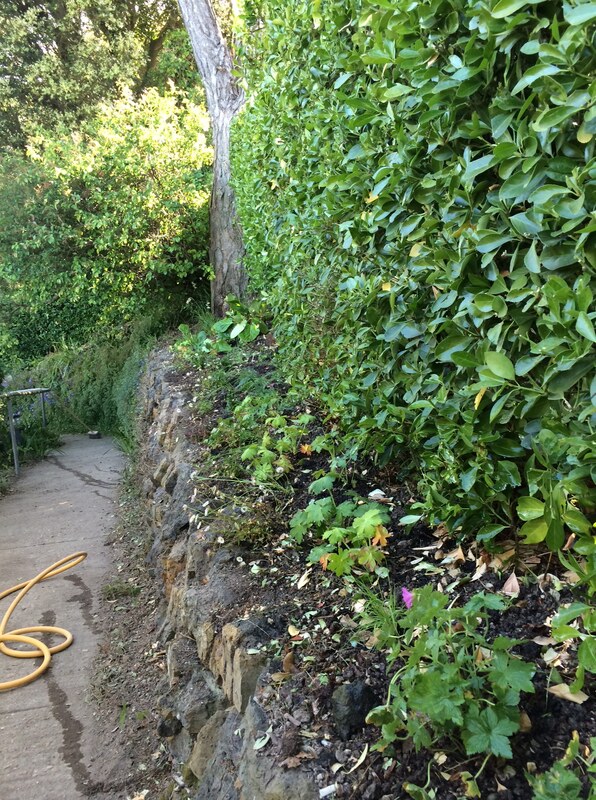 It’ll be so great to have home-made compost – it feels as though this is ‘proper’ gardening now. Does anyone have any composting tips? My son’s discarded walking boots. We had to leave them for a few hours before it was safe to move them. In other news… Our eldest finished his qualifying silver Duke of Edinburgh expedition yesterday – three days of walking (60km) and two nights of camping. It’s been an exciting few months for him but that’s it for a while now. In order to achieve the award, he has to concentrate on finishing his volunteering, physical and skill activities. Oh, and all his school work of course. 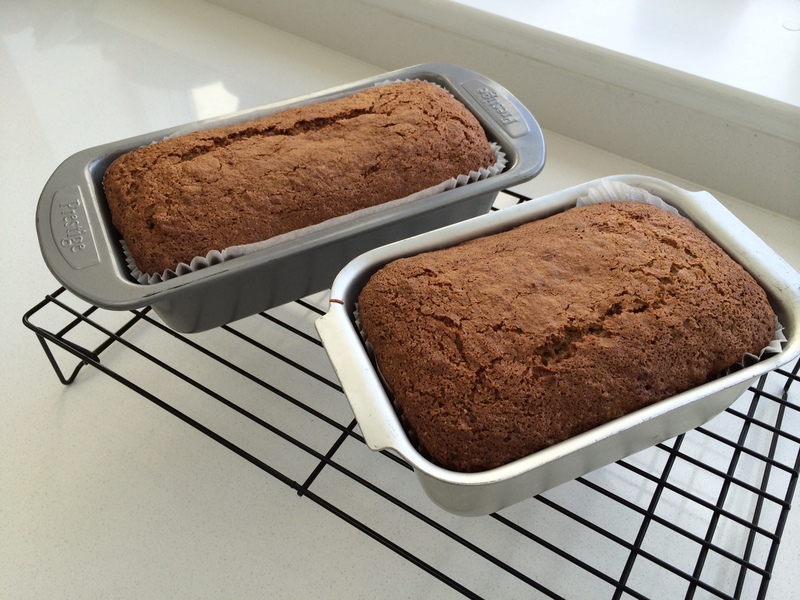 I baked a couple of banana loaves earlier this afternoon for the after-school kitchen-raiders. If you usually eat all your bananas before they have a chance to be over-ripe, I recommend saving a couple to go past their best and use them to make this cake. a time and use 2 medium or 3 small bananas as we don’t like them very banana-y. And you can experiment with types and ratios of sugars. Using all dark brown soft, or a mixture of light (or dark) muscovado and caster, also works well. You could also add a handful of sultanas or walnuts (but my youngest doesn’t like ‘bits’). Line a loaf tin with baking parchment or use a loaf-tin liner. Pre-heat the oven to 160 degrees C.
Whisk the sugars, olive oil and eggs together in a large mixing bowl using a hand-held electric whisk. Do this for a couple of minutes until the mixture is lighter in colour and frothy. Sieve the flour and baking powder into the bowl and use a wooden spoon to fold everything in until fully combined. Add the mashed banana and stir until just incorporated. Pour the batter into your prepared loaf tin, pop in the oven and bake for 40–45 minutes. Stick a skewer into the centre of the loaf – if it comes out clean and the top is springy to the touch, the cake is cooked. If not, bake for a few minutes more. Remove from the oven, place on a wire rack to cool for a couple of minutes before turning out of the tin. It’s delicious eaten while still warm as the edges will be a little crunchy. It will keep for a few days in an air-tight tin, but ours usually disappear quite quickly. Spectacular aliums. I’m enjoying watching the garden progress – it’s so much better when someone else is doing the work! 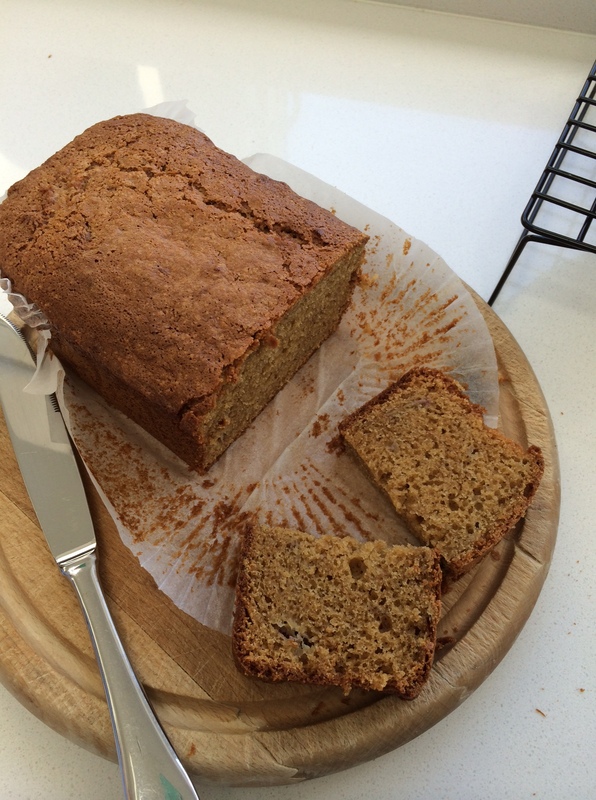 Whenever I find an over-ripe banana, I throw it in the freezer and then make banana cake when I have enough collected. Next time, I’ll try this recipe – looks good. Ha ha, thanks Anne. It is a lot of hard work at the moment but mostly fun. Great idea to freeze over-ripe bananas. Will have to do that. I always try to fit in too many plants – I just can’t stand those empty spaces in between. Good palette of plants for your new entry garden. Eager to see as they fill in and bloom. It’s going to look good and those alliums are gorgeous. My daughter and her cohort had to be evacuated from the New Forest (“Basically mum it’s just one big swamp”) when she was on her final DofE expedition. It was the weekend a poor couple died in a landslide and health and safety kicked in with a vengeance. 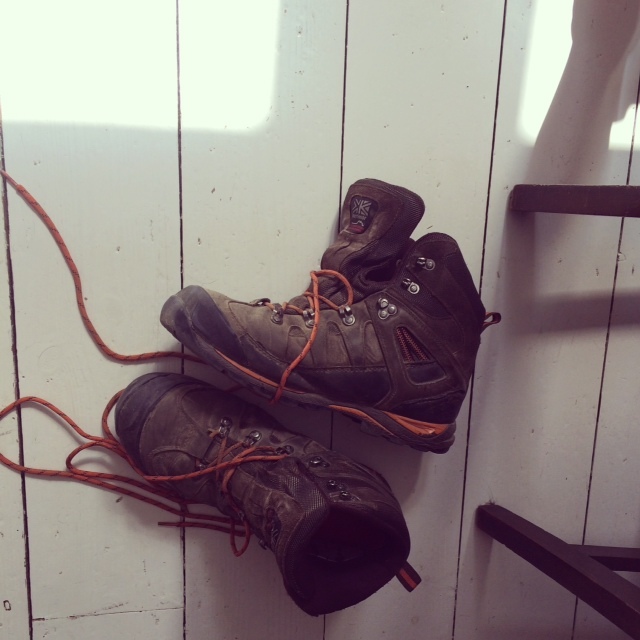 And I did not go anywhere near my son’s walking boots when he returned last summer from two weeks trekking in the Pyrenees. My composting tip is to layer thinly. You never want to add too much of any one ingredient and the ratio of brown to green should be 70:30. You can always wet it if it seem to dry. And the bigger the better. 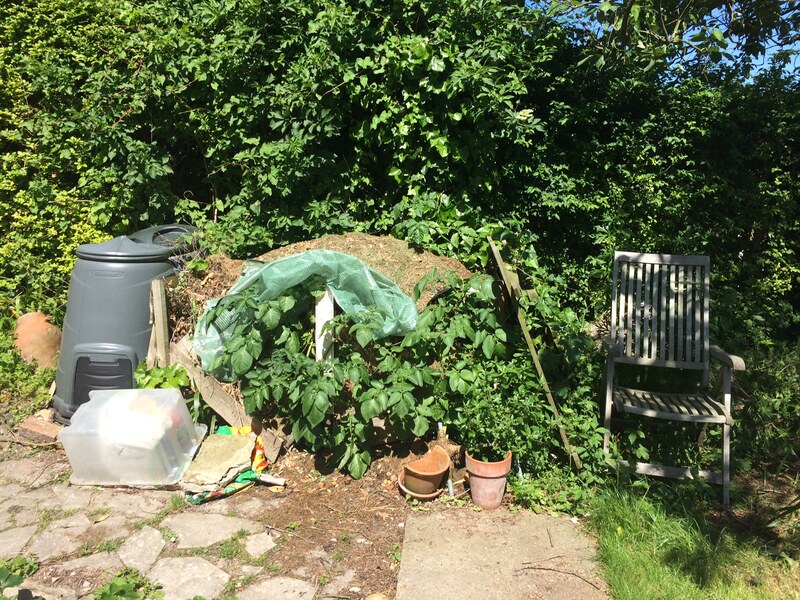 My compost heap at the allotment gets bigger than me occasionally (I’m like Monty and Carol, I compost everything) but soon rots down. My children used to love climbing it when they were small and playing kings of the castle. Happy gardening and good luck with the garden safari. Thank you Sarah. Getting the mix right for the compost will be trial and error I think – there are three bays, all larger than before, so hopefully it’ll work. Have a good weekend. Thanks for the tip, Sarah. I hadn’t thought of straw but that sounds a v good idea. Ooh, yes, and seaweed – I noticed that on a friend’s asparagus bed recently – great suggestion. I’ll nip down at low tide! Have a great weekend.